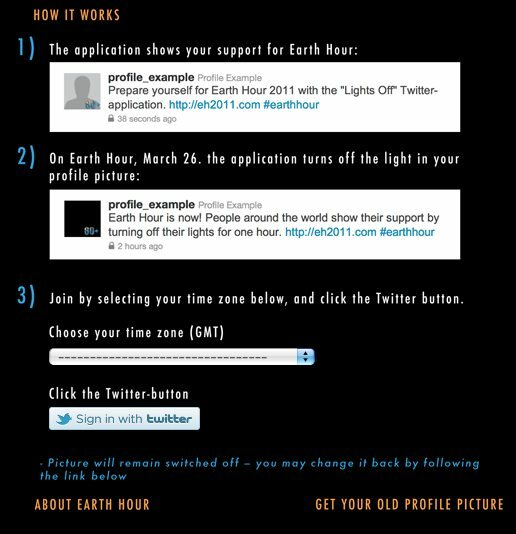 Here’s a fun little Lights Off Twitter app that will show your support for Earth Hour 2011, by “turning off the light in your Twitter profile picture”, when Earth Hour begins at 8:30pm on Saturday 26 March. That is, the Lights Off app should immediately place a “60+” Earth Hour symbol at the bottom right of your profile pic, and then turn the image to black (except for the symbol) when Earth Hour starts in your local time zone. Like most Twitter apps, this one is pretty easy to use. As you can see below, all you do is sign-in while you are logged-in to Twitter, set your preferred time zone, and voila, your own pic should update with the new “60+” logo. One small caution, as you install it, the app does auto-tweet once the message “Prepare yourself for Earth Hour 2011 with the Lights Off Twitter application”, with a link to the app. This shouldn’t be too much of an issue in this case though, as if you are installing the app, presumably you want to help spread the word by telling others. No biggie. One other thing. The picture will remain switched off after Earth Hour, so you’ll have to change it back manually. For ease, you can just click the link on the app page to grab your original image. Alternatively, you could use an Earth Hour Twibbon instead, which can also be added to your Facebook profile pic. That’s it. Not long until the big Earth Hour event rolls around the world now. Oh, and don’t forget to turn your lights out too! Wow. This application is really unique and it sends a really strong message about energy conservation. I like this app a lot. Well , I think this is a way to show interest in world. I am joining and I hope everybody will join. Next post: When Is Earth Hour 2011? What Is Earth Hour? And What’s The Point?